Want to live a rich life on a DIY budget? Then our weekly-ish newsletter is for you! It's free and packed with money saving tips, DIY tutorials, recipes and more! Please check your email for our message & click "confirm"
I used to be that smug person who paid off their credit card balance each month. I had cash to top up my RRSP each year. I spent hundreds of dollars each month on new clothes. I knew the menus from all the local restaurants off by heart. I didn't really think once, let alone twice, about spending. Now I think wistfully about what I could do now with the money I blew on luxuries. I could buy groceries for a month for my family of four, for what I paid for the leather satchel I thought every professional woman needed. But, my lifestyle of spending more time spending, than planning to spend, went the way of the dodo once I became...a mother? Did you think I was going to say mother? No, I needed to tighten my belt when I became the sole breadwinner for our family of two. My husband made the wise decision to change careers and I made the even wiser decision to support him in doing this. The challenge was, our lifestyle was "living two paycheques to two paycheques", now we had more expenses (tuition, gas for the commute to teacher's college, etc) and one lonely paycheque. What was also limiting our "lifestyle" was that we had the opportunity to buy the only house I wanted to buy - my grandparent's property - only this offer to buy had a best before date: during my husband's schooling. So we were in the less than enviable (though short-term - or so we believed) position of spending more than we earned. We learned a lot of good lessons through this year and made some dumb mistakes. I think because this situation seemed short-term we didn't fully embrace the frugal lifestyle. We ran up credit cards, we carried balances, we considered cashing in RRSPs (but I still spent hundreds on clothes each month - Silly Young Me). I was sure that we'd get on top of the bills. But we didn't. We were paying hundreds each month on credit card interest. In the end things turned out well. My husband graduated teacher's college and he is a talented teacher who enjoys his job. We bought my grandparent's property and have since given birth to 2 children here. We paid off those credit cards. I no longer spend hundred on clothes, but I also don't really want to. I'd rather climb out of the pool of debt, than drown in it wearing a fashionable bathing suit. We love hearing from you! If you have a moment, leaving a comment would make our day. 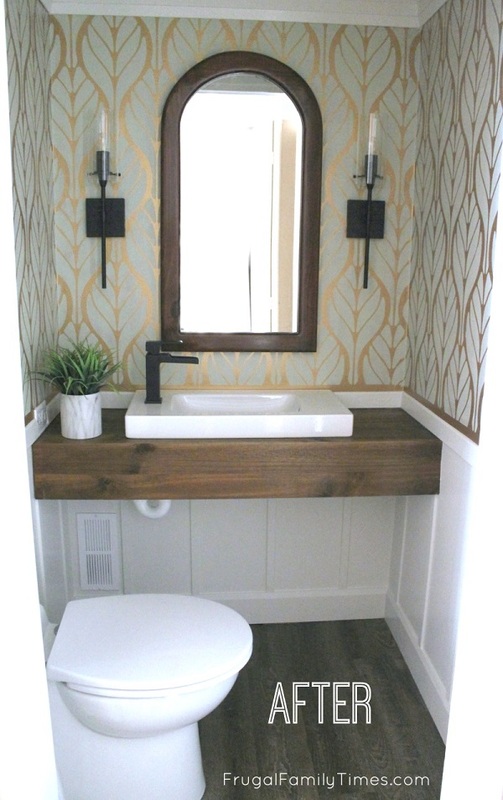 Click above for our DIY Closet to Powder Room projects! © Frugal Family Times. Design by FCD.